After you've added one or more Push creatives, you can copy them (within the same campaign) individually or in bulk to create duplicates. Copied creatives will have all the same settings as the original creative, so you can make small changes to each copied creative to test and optimize performance. TIP: To optimize CTR, you should constantly be testing variations of your creative to find the content that performs best. Try these tips and best practices for testing and optimizing creatives. NOTE: Ad groups are limited to a maximum of 100 creatives per ad group. Follow the steps below to copy a creative within the same ad group. 1. Log into RTX Platform, then click Push in the top navigation bar. 2. Click the name of the campaign that contains the creative you'd like to copy. 3. 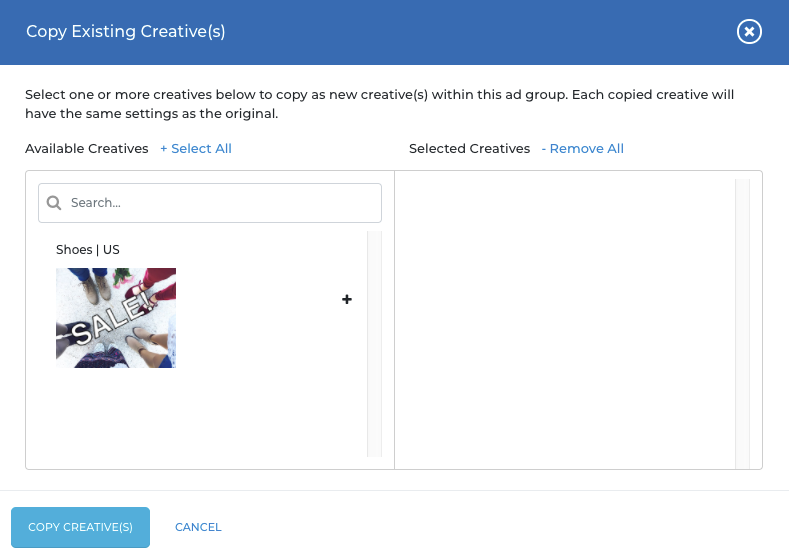 Click the ad group that contains the creative you'd like to copy. 4. Click the blue New Creative button to open the dropdown menu, then select Copy Existing Creative(s) to launch the Copy Creative modal. 5. Click the + next to each creative you'd like to copy in the list of available creatives on the left to move them to the list of selected creatives on the right. Once you've finished selecting creatives to copy, click the Copy Creative(s) button to make copies of the creatives you've selected. TIP: You can also copy creatives from one ad group to another, within the same campaign. If you want to create a new ad group, create one in the same campaign. After you create the new ad group, you will be brought to a page to create a new creative. If you only want to copy creatives and not create any new ones, simply click on the new ad group's name in the top navigation. Next, click the blue "New Creative" button to open the dropdown menu, then select "Copy Existing Creative(s)" to launch the Copy Creative modal. Lastly, click the + next to each creative you'd like to copy in the list of available creatives on the left to move them to the list of selected creatives on the right. Once you've finished selecting creatives to copy, click the "Copy Creative(s)" button to make copies of the creatives you've selected. You can also follow these steps to copy creatives from one existing ad group to another existing ad group, within the same campaign.